I finally had the energy to get some outfit pictures done yesterday! I have been wearing my hair in these braids non stop and I need my hair colored really bad so I have been wearing a lot of hats. But lately it has been easier to clip in my extensions and do some messy braids then curl my hair. I love this sweater from J.Crew. It is great for me being pregnant because it has little slits in the sides so it fits my belly and I went up a size. And of course I can't stop wearing these OTK boots. They are my favorite I wear them with everything. Yesterday I had my weekly checkup with my doctor. I am starting to dilate and efface! So my doctor thinks that I am probably going to have her a little early. Also because she is low and because of the contractions I have been having. I hope she is right! Now that I am 37 weeks I am praying she comes sooner rather then later! Love your sweater! And the beanie look looks great on you. Good luck in your final days of pregnancy! Always dressed to perfection! Great outfit! Jade! You and Emily G. always wear that gold nugget bracelet but I have yet to be able to find it anywhere! Please oh please tell me where it's from! I love love lovve this sweater! 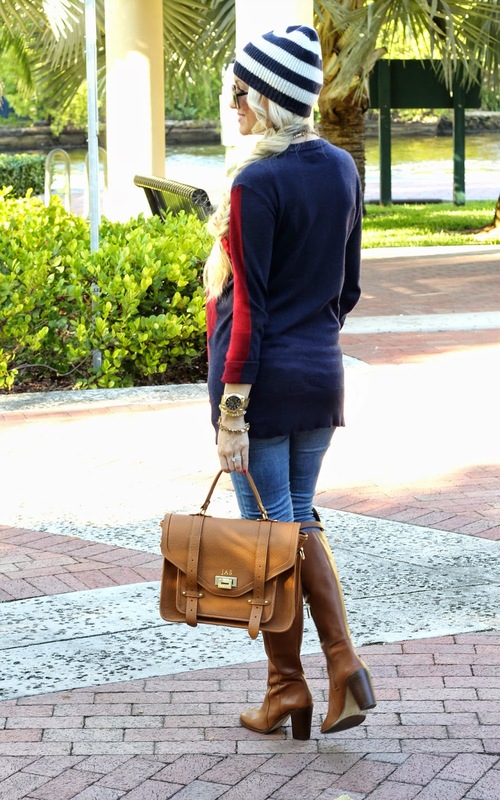 The red/navy combination is unexpected and fun, and I love it paired with those over the knee boots! You are so adorable! I feel like your pregnancy has flown by, goodluck with everything, can't wait to see a photo of your precious babygirl!! This look is simple but chic, love it! Love this look! The hat is amazing! Your hair looks beautiful! Amazing look:) Perfect bany bump as well. I am so obsessed with your hair! That beanie looks adorable! Can't wait for your little girl to arrive! 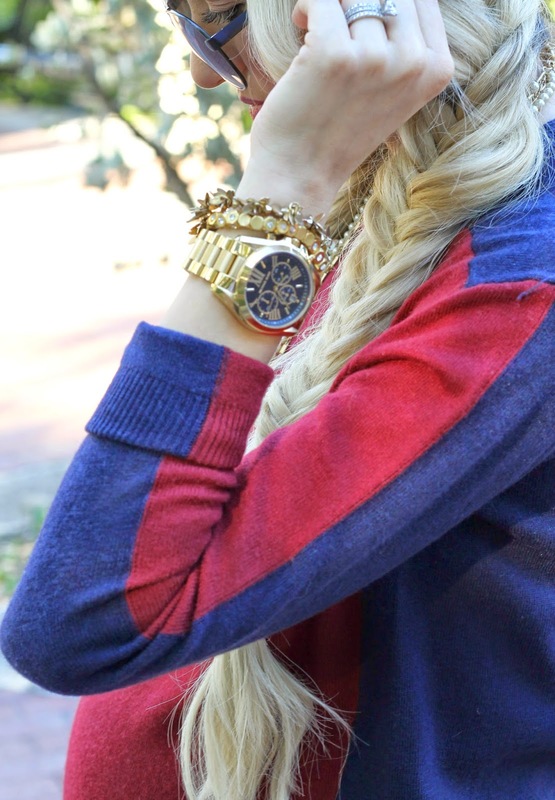 I LOVE the braids!! You look so pretty!